Come discover this secretive land for yourself on a thrilling bicycle journey that will take you from the former royal capital of Mandalay to the temple-dotted landscape of Bagan. Along the way, you’ll get a glimpse at the real face of Burma, as you cycle through rural countryside, sample flavourful regional cuisine, and chat with local traders, farmers, and artisans. Cycling is the perfect way to explore Myanmar at your own pace while visiting some of the most stunning natural, historical and archaeological sites in the in all of Myanmar. The landscape of the country has many unique geographical features, and the varied texture of its landscape offers many cycling routes of varying difficulty, catering for cyclists of all levels – from beginners to experienced and professional athletes. Start your Myanmar cycling tour Mandalay, the regal former capital of 19th Century Burma where your cycling journey begins. Slip away from the main avenues to discover the city’s hidden gems- from a goldleaf workshop where the traditional craft is still practiced, to the breathtaking Mahamuni Pagoda. Fall into the pace of life along the Irrawaddy River as you cycle out of the city to visit ancient cities, quiet village shrines and the world’s longest teak bridge. 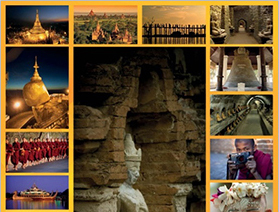 Continue your journey toward the might Irrawaddy River and the plains of Bagan. See what life is like for the city’s inhabitants as you join in the haggling at the Nyaung Oo Market and peek into a lacquer ware workshop. Then head out of the city, to bike through verdant plains among dozens of gracious stupas and pagodas. Myanmar Shalom is ready to provide you with everything you need for your journey: bikes, safety gear and any spare supplies you may need. With her panoramic landscapes and fresh clean air, Myanmar is a cyclist’s dream waiting to be discovered. If you are interested in just short bike ride we can arrange in Bagan and Inle Lake and Mandalay.